this floral image. I have colored it twice here and am absolutely going to be coloring it again and again! 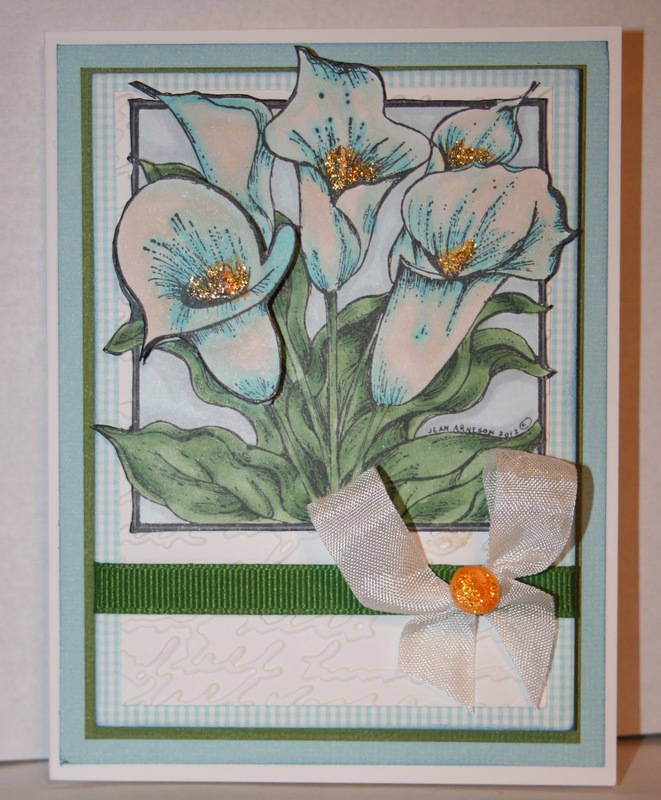 It is a Northwoods Rubber Stamp that I cut out and then also stamped again and cut out the furtherest calla lily on the left side. Then that lily is popped up on dots. A little bit of stickles in the center of the flowers and voila! It's done! Really had fun coloring this ;-D......can you tell? And tomorrow, well tomorrow I head out of town for my copic classes and certification and I AM THRILLED! I think it will be so fun. I will definitely share all about it when I come back. I just noticed that on my pink card I forget to distress where I was holding the card......can you see the place where my thumb was? Will certainly correct that before I send it out! 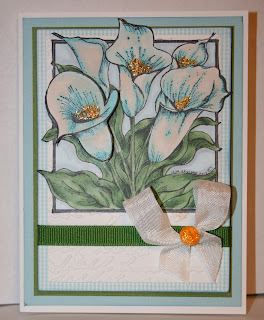 A beauty of a stamp, Sheila - that's for sure! Love both cards - gorgeous coloring! gorgeous cards. It really is a wonderful stamp. Yes, I can tell you loved coloring this stamp! And, so happy for you that you will be taking the Copics workshop and getting certified - Woohoo! What fun! Stunning is an understatement, Sheila! Wow, but these are gorgeous! I will be thinking about you tomorrow - know you will have a blast and learn lots. Not sure you can get much better, tho! Hugs! 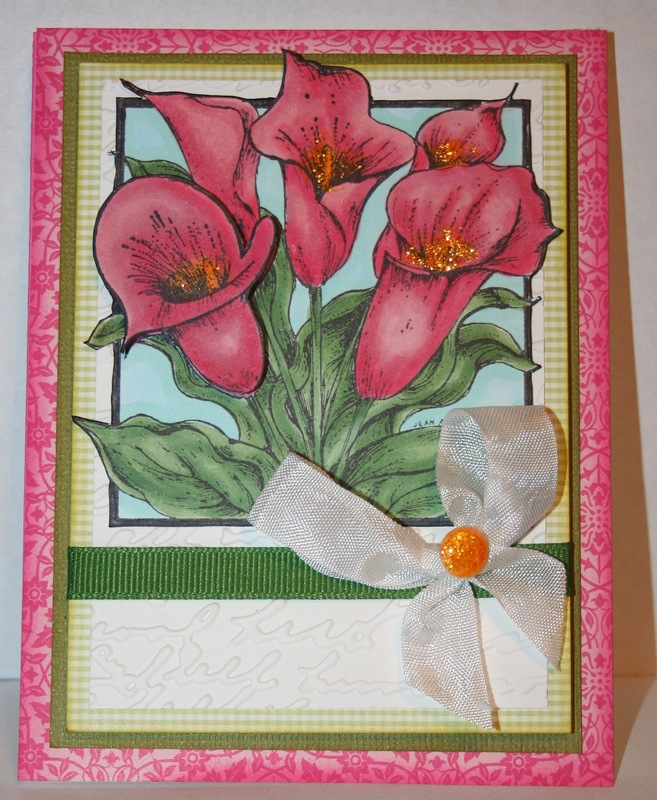 What lovely cards and I would not have noticed where you had your thumb , gorgeous decoupage and the image is fab. What a beautiful image, and you've colores it so beautifully too! These are colored so beautifully Sheila! I am sure that you will get your certificate the moment you walk in the door! This is definitely a very pretty stamp!